Stay at Carolina Hemlocks and experience some of the best camping in NC! The South Toe River runs alongside the campground, creating a great place to swim, trout fish and tube. The campground has sites available for both tents and RV’s, some sites with river views. 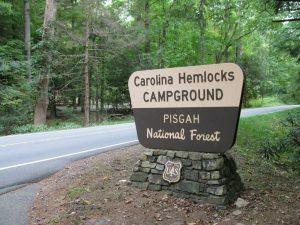 Located in the Appalachian District of the Pisgah National Forest, Carolina Hemlocks is just a short drive from Mount Mitchell State Park and the Blue Ridge Parkway. Looking for a taste of the unique? Asheville is only one hour away. Escape the hustle and bustle – Charlotte and Atlanta are only a few hours away. Be sure to check out our other camping options at Black Mountain and Briar Bottom Campgrounds, just down the road. Camping in NC is the best way to spend a vacation, getaway or special occasion!